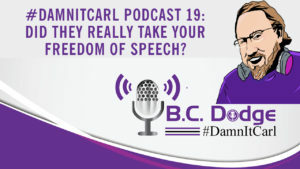 You are here: Home / #DamnitCarl / #DamnItCarl Podcast 19: Did They Really Take Your Freedom of Speech? On this #DamnItCarl podcast B.C. Dodge asks – Did they really take your free speech? On the heels of Laura Loomer handcuffing herself to the Twitter offices, we find that we are once again having to have the conversation of free speech verses platform usage. While it is true that people like Laura Loomer and Alex Jones have lost their social media accounts, and we a line could be drawn as to how this might be infringing on their free speech, we have to keep in mind that place like Facebook, YouTube, Twitter, and Discord, are all private companies; and thus, can do whatever they want. On the hand, as someone that works with social media and digital marketing, it does raise some red flags for B.C., as someday he could wakeup and everything that he has done could be gone…but, once again, they are private companies; and thus, can do whatever they want. If you post hate speech – and this goes for people on the left and the right – and your account is removed because you violated the terms of service. You don’t get to complain. You don’t get to play the “what about them” game. Your first amendment rights have not been infringed upon, you still have the right to open your own website and post your own videos or podcasts. You just can’t use their website. No one is stopping you from saying whatever you want to say, you just can’t say it there.